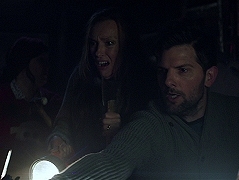 The Engels (Adam Scott, Toni Collette) discuss what to do after the whole street has lost its electricity over night. The Engel family's Christmas dinner turns violent with a fight over Santa and Max's letter. Milly (Toni Collette) shares one last moment with Jess (Drew Barrymore) before she dies. Miranda (Jacqueline Bisset) sneaks Milly (Toni Collette) out of the hospice so she can make it to Jess' (Drew Barrymore) delivery. Meanwhile, Jago (Paddy Considine) tries to patch into the birth from his oil rig. Milly (Toni Collette) asks Jess (Drew Barrymore) a few final favors and then she gives away her best pair of shoes. Milly (Toni Collette) and Jess (Drew Barrymore) catch up over the news that Milly is dying. Jess (Drew Barrymore) confronts Milly (Toni Collette) about her selfishness and tells her that she's pregnant. 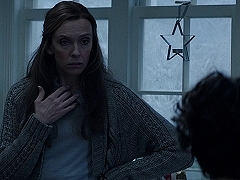 Milly (Toni Collette) lets down her guard and Ace (Tyson Ritter) makes her feel good about her body. Jess (Drew Barrymore) goes along with Milly (Toni Collette) on her spontaneous quest to see the moors from Wuthering Heights. 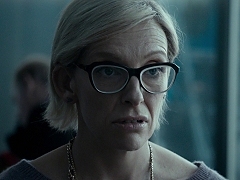 When Kit (Dominic Cooper) throws a surprise birthday party for Milly (Toni Collette), she freaks out on her party guests and argues with Kit before she leaves. Milly (Toni Collette) mourns her double mastectomy at a bar and Jess (Drew Barrymore) helps her get home safely. Milly (Toni Collette) tells Jess (Drew Barrymore) and her family about her cancer diagnosis. John (Jack Reynor) rushes his mother (Toni Collette) to the hospital after she's not responding due to her alcoholism. Compilation of press junket interviews with Toni Collette to promote the theatrical release of "Krampus" in the United States. 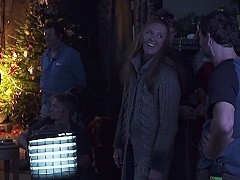 Outtakes from behind the scenes of Krampus, featuring Toni Collette's effort to bring a picture to the wall. Press junket interview with Toni Collette and Drew Barrymore to promote the theatrical release of "Miss You Already" in the United States.